There are generally two problems most people (other than Italophiles) have with Le Marche – the first is simply associating it with Italy, and the second is pronouncing its name. Bordered by the Adriatic in the east and the Apennine range in the west, “Leh Markay” is Italy’s secret gem – some of the country’s best-preserved medieval and Renaissance towns, a treasure-chest of art, culture and cuisine rich in tradition, and landscapes to rival anywhere in Italy. But there’s a lot more too – it’s a region full of surprises, inviting you around the next corner in quest of those special serendipitous discoveries that make experiences so personal and memorable. Here are just a few – five unusual museums that rub shoulders with their more traditional cousins, offering an affable complement to the ample variety of more “classical” museums that permeate the region. While paper was invented in China in the second century AD and brought to the Middle East in the ninth century by the Arabs, it was in Fabriano that the first paper manufacturing plant in Europe was established in the 12th century. After flourishing in the 15th century, the industry went into decline until the 18th century, when it was resurrected by Pietro Miliani, who introduced efficiency, new techniques, and commercial acumen to once again raise the town to its place as Italy’s most important paper-making centre. The Fabriano craftsmen introduced a revolutionary new coating made from animal by-products to prevent the paper from going moldy; adapted a hydraulic hammer mill to replace the Arabs’ hand-operated wooden piston and stone mortar; and invented the watermark. Their expertise resulted in Fabriano being selected to make bank notes in 1780, not just in Italy but also beyond its borders, a function it still fulfills today in the printing of euro currency. It was also the first to produce fine quality tissue paper, and today still produces high-quality handmade paper using the same techniques as 700 years ago. The Paper and Watermark Museum traces the town’s fascinating history of this important craft, with centuries-old machinery and well-preserved manuscripts illustrating its prominence over the ages. The museum is housed in the magnificent 14th century Gothic church of San Domenico. Open Tuesday through Sunday, 10 a.m. to 6 p.m. Closed Monday. Entrance fee: 7 euros for regular entrance, discounts available. The medieval town of Tolentino counts a number of significant events and figures in its history. Most notable among them are the mystic Saint Nicholas, the signing of the treaty between Napoleon and the Pope in 1797 (handing over all papal territory and its assets to the French emperor), and the crucial battle in 1815 in which Austrian forces defeated Napoleon’s brother-in-law, Joachim Murat, King of Naples (and would-be unifier of Italy). But it’s perhaps the International Caricature Museum that’s most unique, being the only one of its kind in Italy, and one of only a handful worldwide. In a country where medieval and Renaissance art predominate, it’s a refreshing step off the mainstream path into the world created by native Luigi Mari in 1970. The museum is housed in the 16th-century Palazzo Sangallo, and is home to over 3,000 caricatures from all over the world – including drawings, statuettes, and puppets – dating as far back as the 1800s. The idea grew from a competition arranged by Mari in 1961 which has since turned into a Tolentino tradition – the Biannual International Competition for Humor in Art. Winning caricatures from previous editions of the competition are amongst the permanent displays. The 2009 event is entitled “The children are watching us (… and laughing at us),” and the entries can be seen in the same building as the museum from July 11th – October 25th, 2009. China once again features in the invention of a product that Italy helped to make popular worldwide, this time the accordion. In a town perhaps better known as the site of the last major battle for Italy’s unification in 1861, Castelfidardo just two years later saw the establishment of the country’s first initiative to manufacture these instruments on a commercial scale. After receiving an accordion as a gift from an Austrian pilgrim on his way to the Holy House in nearby Loreto, young Paolo Soprani disassembled the instrument and realized that he could easily create similar versions. So started a thriving industry that ultimately made local folk music more accessible due to the portability of the accordion. Over the years it has become synonymous with Italian emigrants, whose most immediate connection with their homeland was often their trusty accordion. 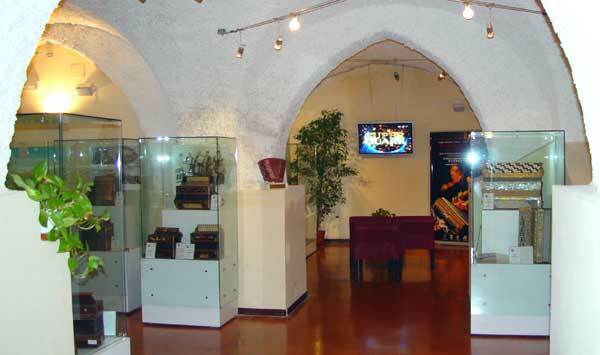 The International Accordion Museum is housed in a 16th-century building, and has over 350 examples of the instrument, including a replica of the first known example from China dating back 4,500 years. There are actually three distinct types of accordion – the diatonic, the chromatic, and the piano – and the list of their constituent parts is quite remarkable, including cashmere, lambskin, rubber, and virgin wax. Every year in October the town holds an accordion festival attracting artists from all over the globe, their dexterous wizardry producing sounds you’d never have believed could come from this humble instrument. Open Tuesday through Sunday, 10 a.m. to 12:30 p.m. and Monday through Sunday, 3:30 p.m. to 6:30 p.m. Entrance fee: 3 euros, with special discounts available. Cupra Marittima‘s history is a world away from its current profile as a quiet seaside town sandwiched between the serried rows of striped umbrellas that define the quintessential Adriatic resort. But even the thriving Roman center of its past as well as its predecessor – an ancient religious centre of the Picene tribe, who worshipped the goddess Cupra in a temple on a nearby hill – pales age-wise when compared with some of the relics contained in one of the town’s main attractions, the Malacological Museum. Home to one of the world’s largest shell collections, it also has an impressive array of fossils, many dating back over 500 million years. The 3,000 square-meter museum has over 900,000 shells – not all of them on display – organized into interesting categories: religion and art, mother-of-pearl, cameos, buttons, tiles, and masks, for example. Naturally there’s also an inviting display of the colorful and unusually-shaped shells in their original state, as well as a curious section dedicated to sharks. Opening times – June: Daily 4 p.m. to 8:30 p.m.; July and August: 4 p.m. to 10:30 p.m.; April, May, September: Tuesday, Thursday, Saturday, Sunday 3:30 p.m. to 7:00 p.m.; October through March: Thursday, Saturday, Sunday 3 p.m. to 6:30 p.m. Entrance fee: 10 euros with special discounts available. Like Cupra Marittima, Pesaro has ancient Roman origins, but its development into the modern age has been starkly different – today it’s Le Marche’s second largest city with a flourishing industry and tourist trade. Among its attractions is the Ceramics Museum with one of the richest collections in Europe. Once a thriving industry in these parts as far back as the thirteenth century, the city was known for its brightly-decorated earthenware known as majolica. Each of the museum’s six display rooms showcases a specific era of the industry’s development, providing rich examples of the workmanship and artistic designs of its craftsmen. You’ll find exquisite creations depicting historic scenes, floral motifs – in particular the pink rose, symbol of Pesaro – and the more modern artwork of the twentieth century. The museum was founded in 1857, and today has over 3,400 pieces. Also housed in the same 17th-century Palazzo Toschi Mosca is the art gallery, containing Giovanni Bellini‘s masterpiece, The Coronation of the Virgin. Open Tuesday through Sunday, 9:30 a.m. to 12:30 p.m., also Thursday through Sunday, 4 p.m. to 7 p.m.; from July 1 through September 13, open until 10p.m. on Friday. Closed Monday. Entrance fee: 12 euros with special discounts available. Some days are free, see Web site. Combined tickets available for other Pesaro attractions. Duncan Campbell, a regular contributor to Dream of Italy, now operates Le Marche Tours, specializing in small-group cultural, historic, nature, and curiosity tours of Italy’s best-kept secret, Le Marche. He shares his discoveries as he roams around the region on his blog, Uncommon travel in authentic Italy.